1 Plant. 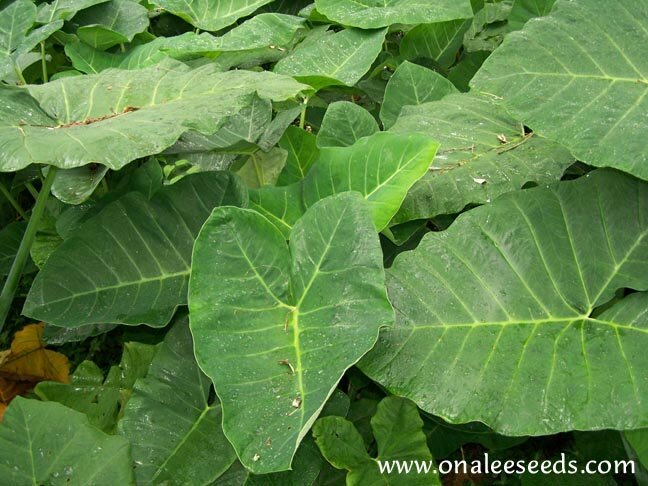 This 2 - 3 year old Arrowleaf Elephant Ear plant will add that tropical look to your poolside landscape or shade garden in a fast and beautiful way. The plant is from 24 - 36 inches high (but leaves will be cut for shipping)and is suitable for growing in a container or in the garden. Fast growers! This is a giant green tropical Elephant Ear, (Colocasia Esculenta), also called Taro, Dasheen or Eddo - the same ones you see in the hit show 'LOST'. You are buying ONE LARGE PLANT/BULB that is 2 - 3 years old and is currently 24 - 36 high. THE LEAVES WILL BE CUT BEFORE SHIPPING to reduce stress on the bulb (they bulb won't have to try and support the large leaves during shipping and transplant). Once you have it planted in it's new home, it will start producing new leaves within just a few days. Unlike many elephant ears, the older plants do bloom every year in late summer with a beautiful large white blooms - see photo! The photo shows the leaves of some of my LARGE MATURE PLANTS - I have some that are well over 6 feet high and as wide! Add that tropical look to your poolside landscape or shade garden in a fast and beautiful way. Plant in a good soil in filtered sun or full shade and with just a little fertilizer and water it will amaze you with its rapid growth. The leaves are a bright deep green and can reach 5' long by 3' wide. 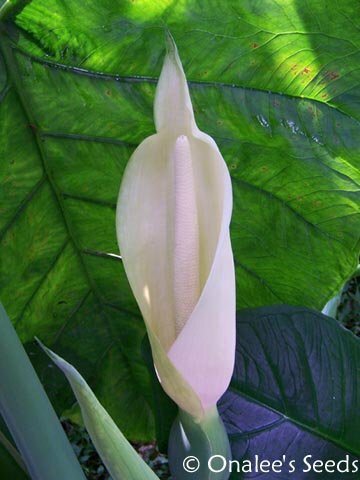 It does flower with blooms that resemble large white calla lily blooms. Hardy zones 8 - 11 it will be killed to the ground by frost but will rapidly grow back from the underground bulb. Northern growers can store the tuber of this plant over the winter like other bulbs. Planting instructions will be included. ??????? BUY MORE AND SAVE! ???????? Every addtional Green Elephant Ear purchased after the first is only $6.00! !